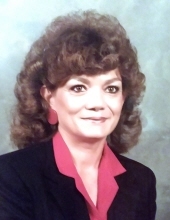 Patricia Ann Peedin Watts, 70, passed away peacefully at home on Sunday, October 21, 2018 surrounded by her family. Patricia was born in Johnston County on September 8, 1948 to the late Claude and Ruth Anderson Peedin. She was married to the late SMSGT Robert Watts, Retired U.S.A.F. Patricia retired from the United States Postal Service. Patricia was a generous and gracious woman. She will be remembered for the love and laughter that she shared during her well-lived life. Graveside services will be held Wednesday, October 24, 2018 at 1:00 p.m. at Evergreen Memorial Cemetery with Rev. Liz Hounshell officiating. The family will greet friends immediately following the service at the cemetery and other times at her home. Patricia is survived by her daughter, Kathy Merritt; grandsons, Travis Merritt and Brandon Merritt; sisters, Janie Parnell of Kenly and Linda Jackson (Johnny) of Texas; several nieces and nephews whom she loved very much; and her fur babies, Lady, Angel and Pepper. In addition to her husband and parents, she was preceded in death by her beloved sister, Edna Jackson. Flowers are welcome or memorials may be made in her memory to Cures for the Colors, 203 Cox Blvd., Goldsboro, NC 27534. To send flowers or a remembrance gift to the family of Patricia Ann Watts, please visit our Tribute Store. "Email Address" would like to share the life celebration of Patricia Ann Watts. Click on the "link" to go to share a favorite memory or leave a condolence message for the family.